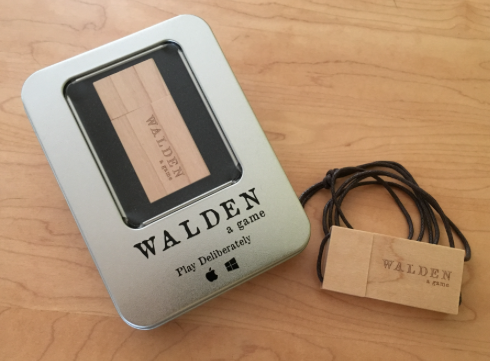 Walden, a game is available for PC and Mac at our homepage on Itch.io, which is a distributor of indie games. Be sure to save the link they give you to download the game, in case you need to download the game again or update it in the future. If you lose your link, you can request that Itch.io re-send it to you here on their support page. It is also now available on the PlayStation Store for Sony PlayStation 4. What hardware and software do I need to play? The game works on either Windows PC's, Macintosh computers or PlayStation 4. It is not available for mobile phones or tablets. I'm playing on windows 7 and the game freezes as soon as i open it! 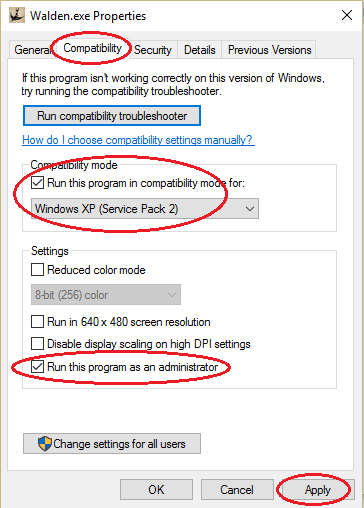 If you are running Windows 7 and the game seems to get stuck after you first open it, you may have to set two things to get it to run: 1) Compatibility Mode; and, 2) Run as Administrator. To set these, right-click on the Walden.exe and select “Properties”. From the resulting window, click on the “Compatibility” tab. In the “Compatibility mode” section of this tab, check “Run this program in compatibility mode for:” and select “Windows XP (Service Pack 2)” from the drop-down list of options. Then, on the same tab, under the “Settings” section, check “Run this program as an administrator”. Click the “Apply” button at the bottom to save these changes. You should now be able to run the program by double-clicking on the Walden.exe. Can i play this game on my phone or tablet? No. Walden is a full-blown, 3D game that requires the processing power of a traditional laptop, desktop computer or game console. See the System Requirements above for more info. Can I play this game on a Chromebook? No. We have developed the game to run on Mac and Windows computers, as well as the PlayStation console, but, unfortunately, Chromebooks are not powerful enough to run intensive 3D games like Walden. How do I set up the game once I download it from Itch.io? Once you purchase the game, you should get a link to both the Windows version (walden-windows-pc.zip) and the Mac version (walden-macintosh-osx.zip). Choose the correct version for your computer type and click to download. The zip file might take some time to download depending on your Internet connection, so be patient. Once the zip file is completely downloaded, you'll need to upzip it. Usually, the zip file will have downloaded to your "downloads" folder, or wherever your default download location is set to. Right click on the zip file and select "Open With" whatever archive utility you have installed on your machine. Extract the entire Walden folder. Important: Do not move the application file or data file out of the Walden folder. Once the game has been unzipped, it is ready to play -- double-click to start the game. Yes! To buy a digital copy on Itch.io as a gift for someone, check the box next to "Give this game as a gift," as shown below. 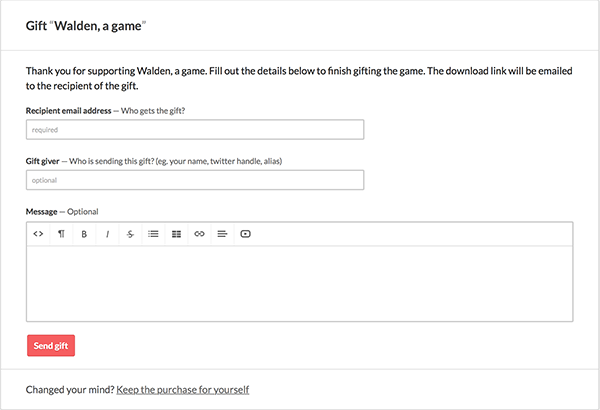 Then, after the purchase is complete, fill out and submit the "Gift Walden, a game" page with the gift recipient's email address, the gift giver's name, and any message you'd like to add. What is the Box Set? The Box Set includes a lovely tin, an engraved 4GB Pine USB drive loaded with versions of the game for both Windows and Mac, as well as a unique key in the box so that the person who receives it can register their software for future updates. As the purchaser, you will also receive your own unique download link, so you can register and download an extra digital copy of the game for yourself. You can purchase the Box Set for $39.95 USD (shipping included) on our homepage at Itch.io. I'm an educator. Can I get a review copy of the game? Yes, absolutely! Please visit our page for Educators for more info. I get a warning when I open the app, what should I do? You may see a warning that "this software has been downloaded from the Internet" the first time you play. Simply choose to open the game, and you will not see the warning again. I don't see a cursor. How do I use my mouse? If you are on the Main Menu (or any other menu in the game) use the arrow and enter keys to make a selection. If you are in the game world, you will not see a cursor, but you can still use your mouse to look around. Use the W, A, S and D keys to move. Center the screen on objects you want to interact with and click the left mouse button to activate them. To find out more information about an object, center the screen on it and press and hold the right mouse button. It's my first time playing a first-person game, what should I do? Don't worry! There's a first time for everything! The first thing you'll need to understand is how to move and look. Think of the W, A, S and D keys as moving your "feet" in the game -- they will move you forward, left, backward, and right respectively. Where "forward" and such are also depend on where you are looking, though. So think of the mouse as moving your "eyes" in the game. Move the mouse in small changes to adjust where you are looking. Remember, you can move your head and feet at the same time, using both your W, A, S, and D keys together with the mouse. Practice moving a bit until you get the hang of it! Once you are comfortable moving, you can try interacting with objects in the world. Move close to an object, center your view on it, and left click with the mouse to interact, or right click and hold to find out more information about the object. I get a warning that my computer is not playing the game optimally, what should I do? Depending on your computer hardware, you may need to play the game at a lower resolution or quality setting to achieve a fast enough frame rate for optimal play. Close the game and start the application again, this time selecting one of the lower settings. If you still get the warning, you can still play the game, though it may be a bit jerky at less than 15fps. I HAVE A MAC AND MY MOUSE WON'T RIGHT-CLICK. HELP! a) Click on the Apple icon in the upper left of your screen, select "System Preferences". c) Make sure that “Secondary click” is checked. d) Immediately below “Secondary click”, there should be a selection option (down arrow) that will allow you to set the Secondary click to register with either a click on the right side or the left side. Alternatively, if you have a trackpad on your Mac laptop, you can use the 'two-finger-click' (put two fingers on the trackpad and click with both of them at the same time) to activate a right-click. IN WINDOWS, AFTER I EXTRACTED THE .ZIP FILE, WHEN I CLICK ON WALDEN.EXE, I GET AN ERROR ABOUT 'MISSING INFO'. If you double-click on a .zip file in Windows, some extractor applications will temporarily unzip all the files within the extractor app, itself. The Walden.exe will not run correctly in this case. Instead, you'll want to right-click on the .zip file and select "Extract All" to unzip all the files permanently to their own folder/directory. From this permanent location, double-clicking on Walden.exe will launch the game. The other possibility is that, although the files were correctly unzipped, the Walden.exe application was moved out of the folder containing the Walden_Data folder. The Walden.exe and Walden_Data folder must both be in the same directory/folder for the game to run correctly. Can I save out my in-game journal? Yes! Thanks to the generous work of one of our players, Atul Varma, players can now save out their in-game journals. Just download and unzip the journal extractor tool. The zip file contains versions of the tool for Mac and PC. Unzip the package and open it on the computer that has the save game from which you want to extract the journal. The tool will locate all the save games on that computer and allow you select the one you want and copy its journal out to various formats including Word, PDF and HTML. I need help with something else! If you have questions about anything else, including support for all versions of the game, including the PS4, you can contact us here: Walden support.